Our muscles may actually possess a molecular memory in the form of epigenetic marks on our DNA. According to a study published in Scientific Reports, these chemical tags tell a tale of when skeletal muscles grew after exercise and could possibly help them grow bigger later on. The study conducted by researchers at Keele University – which looked at over 850,000 sites on human DNA – contributes to the epigenetics of exercise. It suggests that genes can “remember” skeletal muscle growth or muscle hypertrophy. In this case, the epigenetic memory is stored above the DNA in the form of DNA methylation, a popular epigenetic mechanism that can influence gene expression. Similarly, your age might influence the epigenetic benefits of exercise. Methyl groups suppress gene expression or turn genes off when added on top of DNA via methylation. When methyl groups are removed, gene expression is increased. It’s important to note that these epigenetic changes can influence gene expression without ever altering the underlying genetic sequence – the A, C, G, T bases we are familiar with. Schematic representation of the experiment and types of analysis performed across the time-course. More details in Scientific Reports. 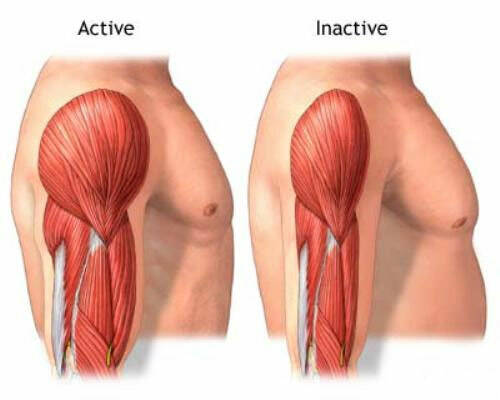 Their results show for the first time that epigenetic marks are not only adjusted as a result of resistance exercise, but can be remembered later on for muscle growth, even after the muscles may have returned back to their initial size. There were varying levels of DNA methylation at three measured stages: after resistance exercise (loading), cessation of resistance exercise (unloading), and return to resistance exercise (reloading). The entire program lasted for 21 weeks, each stage consisting of 7 weeks. The team performed genome-wide DNA methylation and gene expression analyses and found that epigenetic tags had been added or removed from certain genes after the muscles grew, returned to normal, and then grew again. They identified the largest frequency of hypomethylation (a reduction in methylation) across the genome after reloading compared to earlier loading. Accordingly, lean muscle mass increases were greater after reloading compared to initial loading. Genes including AXIN1, GRIK 2, CAMK4 and TRAF1 displayed increased DNA hypomethylation together with enhanced gene expression across loading, unloading and reloading. Notably, hypomethylation was maintained even while the muscles returned to their baseline size following initial resistance exercise. 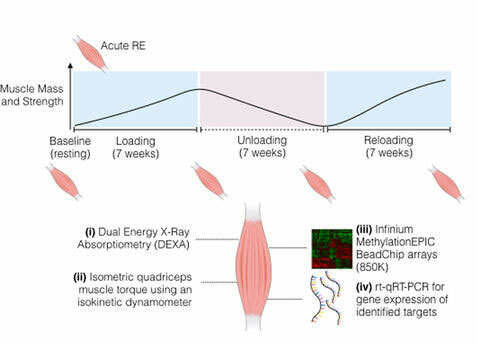 This indicates a possible epigenetic memory of earlier muscle growth. The results could have far-reaching influence on athletes who have been banned for using drugs to build muscles and enhance performance. It is possible these drugs could actually create long-term changes to the muscles, continuing to affect performance long after the athlete has served his or her short-term ban. Epigenetic muscle memory of previous growth during a period of active, resistance training (left) is retained and remembered even during a period of inactivity and reduction of muscle mass (right). Since the study was conducted with previously untrained male participants, the results can apply to the casual gym-goer, but the data have key implications in how professional athletes train and recover from injuries. Plus, it could drastically shift the rules and consequences in place for when athletes engage in cheating. Interestingly, athletes may be able to improve their recovery from an injury and accompanying muscle loss if we can pinpoint the genes responsible for muscle memory, according to Dr. Sharples. Source: Seaborne, R.A., Sharples, A.P., et al. (2018). Human Skeletal Muscle Possesses an Epigenetic Memory of Hypertrophy. Scientific Reports, 8(1). Reference: Keele University. Study proves ‘muscle memory’ exists at a DNA level. Keele University Press Releases. 30 Jan 2018. Web.